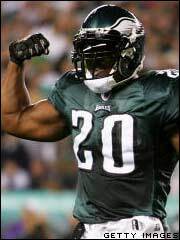 you didn't have a brian westbrook to help him pad his %, yards, and TDs. i watched all but one of his games this past year because i was shocked he decided to stay another year. the only way locker is even in the league 5 years from now is as a clipboard holder (or ****ty starting QB on a perennially ****ty team like the bills or redskins). figures. after a year of mcnabb of course locker looks accurate to you. shanny should be able to draft well if he's going to be picking in the top 10 every year. really? because the first thing he did to shanahan was saddle him with a washed-up QB he (shan) never wanted. why the F would they franchise moss? are they issuing press releases about all the other declining, 3rd tier players on the roster? maybe they'll make him the new all-time highest paid S like they did with archuleta. blame JKC for ever letting snyder have the opportunity to buy the team just so his kin could weasel around estate taxes. F you all. you deserve this. i'm pretty sure no one gives a ish about hall. this seems like one of the worst QB drafts in a while. i drink a lot so maybe i'm forgetting, but exactly who is fletcher's competition at MLB in the nfce? don't undersell one of the few bright spots! they gave us a 2nd for mcnabb, so yes. some of the years we fell short were infuriating because we had the talent. this year, i don't think we've ever had so many flat-out terrible players on defense, patterson and sims, especially. the worst we used to have would be "average", but having to field scrubs is something no scheme can overcome. hopefully the stupid hype over chaney is done as well.